Cancer occurs when cells in the body (in this case gallbladder cells) divide without control or order. Normally, cells divide in a regulated manner. If cells keep dividing uncontrollably when new cells are not needed, a mass of tissue forms, called a growth or tumor. The term cancer refers to malignant tumors, which can invade nearby tissue and spread to other parts of the body. A benign tumor does not invade nor spread. The exact cause of gallbladder cancer is unknown. Ethnicity: Native American and Hispanics have a higher incidence of gallbladder cancer, perhaps because they also have a higher incidence of gallstones. In addition, women are more likely to get gallbladder cancer than men. It is also more common in older individuals. The disease often shows no early symptoms. The symptoms often mimic those of other gallbladder conditions (such as gallstones). The gallbladder is hidden by other organs in the abdomen. Gallbladder cancer is sometimes discovered during abdominal surgery for another reason. Ultrasound — a test that uses sound waves to examine internal organs, in this case, the gallbladder and bile ducts. The radiologist will examine the gallbladder with the ultrasound probe and may see stones inside; stones often can mask the presence of cancer. CT scan — a type of x-ray that uses a computer to make pictures of the inside of the body, in this case, the liver, gallbladder, bile ducts, and surrounding tissue. The CT scan can help determine if the gallbladder is calcified or surrounded by a lining of calcium. This condition is called a porcelain gallbladder and can be caused by the growth of cancer cells. The CT scan is also helpful to determine if the cancer has spread to the lymph nodes or liver (the two most common places for gallbladder cancer to spread). Cholangiography — an invasive test that uses x-rays and a large needle inserted into the liver to examine the gallbladder and bile ducts. This can be done to collect cells from the bile ducts to help diagnosis cancer. Endoscopic retrograde cholangiopancreatography (ERCP) — a test that combines x-rays and an endoscope, which is a long, flexible, lighted tube inserted down the throat. This is done to examine the duodenum (first part of the small intestine), bile ducts, and pancreatic ducts. It can also be used to collect cells to help diagnose cancer. A biopsy, which is the removal of a sample of tissue for testing, must be done to definitively diagnose gallbladder cancer. This often requires open surgery. 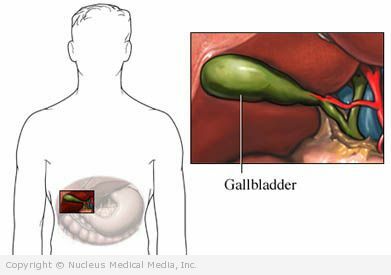 Many times gallbladder cancer is found by accident. The patient is often taken to surgery because of a gallbladder “attack.” At surgery, the surgeon may find cancer or it may only be found once the pathologist has sliced the entire gallbladder into very small slices. Chemotherapy is the use of drugs to kill cancer cells. The drugs enter the bloodstream and travel through the body killing mostly cancer cells, but also some healthy cells. Chemotherapy is not considered curative for gallbladder cancer, but may relieve symptoms in some patients. CMT is a term gaining popularity and meaning several treatments at once or in succession. Although no one has shown that chemotherapy and radiation therapy at the same time are better than radiation therapy alone in the treatment of gallbladder cancer, CMT is better with many other kinds of cancers. There are no guidelines for preventing gallbladder cancer because the cause is usually not known. There may be an association with gallstones. Because gallbladder cancer is rare, doctors do not recommend the routine removal of gallbladders in people with asymptomatic gallstones to prevent cancer.